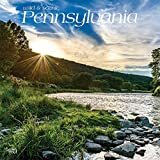 This 2019 Pennsylvania Wall Calendar features scenes from across the state, including views of Pittsburgh at the University of Pittsburgh's Cathedral of Learning, the Pennsylvania Grand Canyon, Erie's Presque Isle State Park, Berks County's Roadside America, Kennywood Park, Parker Dam State Park in Clearfield County, Cole Run Falls in the Laurel Highlands, the Standing Stone Trail in Huntingdon County, Raystown Lake, Hickory Run State Park in the Pocono Mountains, Allentown's PPL Building, and Worlds End State Park. Pennsylvania’s diverse and glorious natural landscape includes a wide variety of flora and fauna, coastal waters, lush forests, and impressive foliage. The Keystone State includes 116 state parks, which are home to white-tailed deer, black bears, and hemlock trees. Explore this breathtakingly beautiful state with this Wild & Scenic Pennsylvania square wall calendar. Pennsylvania Railroad 5368, one of 425 Class K-4s Pacifics (4-6-2), is on northbound commuter train #720 coming through Red Bank, New Jersey, on January 29, 1955. February 20, 1966, was new-vehicle-delivery day. Electromotive Division has just delivered three brand-new six-axle SD-40 s to the Pennsy. They were built in LaGrange, Illinois, and delivered to Chicago. Pennsylvania Railroad 6969, one of twenty-five Class M-1 Mountains built by the Lima Locomotive Works, is on an eastbound coal train stopped at Cove, Pennsylvania, on March 10, 1957. It is May 12, 1956, and four Pennsylvania Railroad Class I1sa Decapods (2-10-0) are at the general store in Crowl, Pennsylvania. Each visible engine has another coupled behind it. The 4311 will take the point and two more engines, led by the 4249 and the cabin car, will be entrained behind the last car. Pennsylvania Railroad 6923, a Class M-1 Mountain (4-8-2) is helping a Class K-4 Pacific with a westbound passenger train at Horseshoe Curve, Pennsylvania, in the summer of 1949. Pennsylvania Railroad operated a host of switch engines, but these were Critters, a small fleet of 390-horsepower, 44-ton diesel switchers. It is July 17, 1959, and the 9324 is working at Altoona, Pennsylvania, shuffling work cars, as seen from the Twelfth Street Bridge. On August 23, 1953, Pennsylvania Railroad 1820, a Class G-5 4-6-0, one of ninety built by the company s Juniata Shops between 1923 and 1925, has been serviced (note the coal pile in the tender) and is awaiting a call at the Camden, New Jersey, roundhouse. These were the largest ten-wheelers ever built. Pennsylvania Railroad 7183 is on an Enola-bound freight, crossing the Rockville Bridge at Marysville, Pennsylvania, on September 5, 1964. Pennsylvania Railroad 4828, a Class I1sa built in 1923, is assisting an F3A-F3B set of diesels on a freight near Tharptown, Pennsylvania, on September 25, 1957. The 4828 and its 597 mates did not win any gold stars from their crews, as they were rough riding. Pennsylvania Railroad Class GG-1 Motor 4928 is running light slowly through the South Philadelphia Yard on December 2, 1967. Pennsylvania’s diverse and glorious natural landscape includes a wide variety of flora and fauna, coastal waters, lush forests, and impressive foliage. The Keystone State includes 116 state parks, which are home to white-tailed deer, black bears, and hemlock trees. 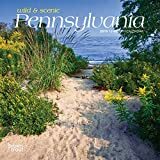 Explore this breathtakingly beautiful state with this Wild & Scenic Pennsylvania mini wall calendar. Philadelphia played a leading role in the founding of the United States. Both the Constitution and the Declaration of Independence were adopted here, and Philadelphians will proudly tell you that the City of Brotherly Love was the first capital of the United States. Today, Philadelphia continues to be a city with much energy and character. 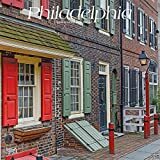 Featuring stunning images of landmarks and locales both historical and modern, this square wall calendar pays tribute to the great city of Philly. 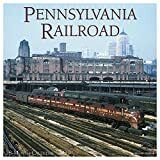 Founded in 1846, the Pennsylvania Railroad (PRR) began with a route from Harrisburg to Pittsburgh and expanded exponentially after that as an institutional icon. At its peak, "Pennsy" served millions of travelers and is still regarded as one of the greatest all-American railroads in history. This large format wall calendar features grids with ample room for jotting notes and begins with six bonus months of July through December of 2018. Also included are moon phases (CST), along with U.S. and international holidays. Pennsylvania's diverse and glorious natural landscape includes a wide variety of flora and fauna, coastal waters, lush forests, and impressive foliage. The Keystone State includes 116 state parks, which are home to white-tailed deer, black bears, and hemlock trees. 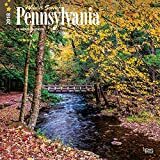 Explore this breathtakingly beautiful state with this Wild & Scenic Pennsylvania square wall calendar. Pittsburgh stands tall and proud along the banks of its three rivers. Long known as the Steel City and admired for its tradition of hard work and industrial prowess, Pittsburgh is also a city rich in history, diverse neighborhoods with stunning architecture, art institutions, and numerous bridges. 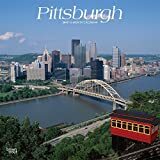 Featuring beautiful images of historic and contemporary locales, this Pittsburgh square wall calendar showcases the grandeur of this picturesque city.